Volunteers from Lough Ree RNLI had a successful training exercise with the Sligo-based Irish Coast Guard helicopter Rescue 118 on Sunday (June 11 ). 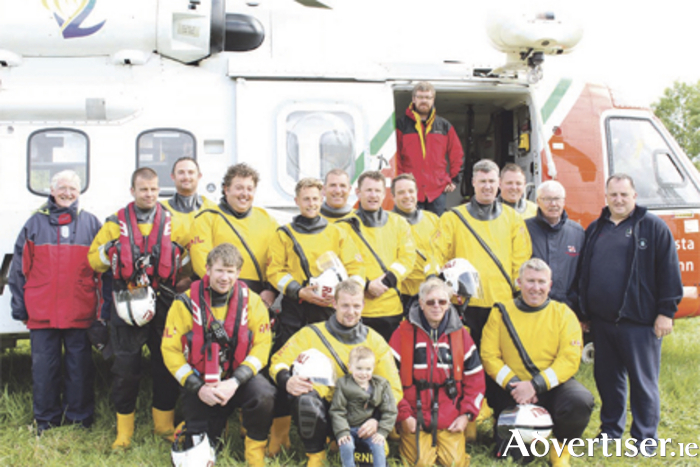 The lifeboat and helicopter crews came together for a joint training exercise at Lough Ree Yacht Club where the RNLI crew, family members, and Yacht Club members were invited to tour the helicopter. Weather conditions were windy during the exercise with a force 4 rising to force 6 wind with frequent rain showers blowing through. After a briefing from the pilot and crew of Rescue 118, the exercise got underway with the lifeboat crew members being winched between their inshore lifeboat The Eric Rowse and the helicopter. The strong winds enabled easier hovering for the helicopter and provided the lifeboat crew with invaluable experience of operating in close proximity to the helicopter.